The Henry Stommel Medal in Oceanography is presented "for fundamental and enduring contributions to observing and understanding ocean processes." The award, a gold medal and monetary prize, is named for the late WHOI oceanographer Henry Stommel, who died in 1991 at age 71. In January 1993 the Stommel Medal was established by the WHOI Trustees in honor of the world renowned physical oceanographer who made many contributions to nearly every area of physical oceanography and is credited with establishing the modern concepts of ocean circulation. Stommel was highly regarded by his colleagues for his sense of humor, his zest for life, his generosity, and his inspiration to legions of oceanographers. Hank Stommel was in his second year as an astronomy graduate student at Yale University when he came to WHOI in 1944 as a way of serving his country without going to the battlefield. From then on, he was affiliated with and lived near the Institution until his death in 1992, although he held faculty positions at Harvard from 1960 to 1963 and MIT from 1963 to 1978, when he rejoined the WHOI staff. 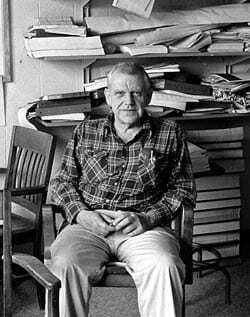 In their introduction to a 1992 special Stommel issue of Oceanus magazine, Jim Luyten and Nelson Hogg wrote, “For most of the past 50 years, Henry Melson Stommel was the most influential figure in oceanography. Through his simple brilliance, his personal magnetism, and his great zest for life, he inspired legions of oceanographers.”Colleagues tend to describe a scientific conversation with Stommel as a situation where they had to “hang on” to follow his intellectual gymnastics. Luyten lists three essential Stommel qualities: insatiable curiosity, extraordinary intuition (he was relentless in stripping problems down to their most elemental levels), and the ability to visualize physical processes fully in three dimensions. Hank was also well known for his generosity with ideas—he sparked many individuals’ research directions and initiated a number of collaborative oceanographic programs, both large and small. Most facets of modern physical oceanography benefited from Stommel’s insights, and he received many awards for his work. He is probably best known for major steps taken in the 1940s and 1950s toward understanding the general circulation of the ocean: He determined that the rotation and curvature of the earth are essential factors producing intense currents on the western sides of all oceans, and that changes in density caused by cooling and evaporation at the sea surface can be responsible for deep flows in the ocean. With these factors accepted, other theories about global circulation began to fall into place, and Stommel worked enthusiastically with a broad range of colleagues for the rest of his life to articulate them.